Through July 22 – South Carolina Peach Festival at various locations around Gaffney. Over this two week period, you’ll have the chance to experience a dessert contest, a dog show, a 5K and 10K race, a New Talent Night, wrestling, a mud bog and more! For more information call (864) 489-5721 or visit http://www.scpeachfestival.net/. Through July 23 – “Xandadu” at the Chapman Cultural Center in Spartanburg. This fun presentation is based on the 1980 musical with Olivia Newton-John. For more information call (864) 542-2787 or visit https://www.chapmanculturalcenter.org/pages/calendar/detail/event/c/e1598/. Through July 26 – Recenting Paintings by Dorothy Shain, Glory Day Loftin, and Kiah Bellows at the Greenville Center for Creative Arts in Greenville. See the new works of three of Greenvilles fabulous artists. For more information call (864) 735-3948 or visit http://www.artcentergreenville.org/past-exhibits/. Through July 30 – “Titus Andronicus” at the Warehouse Theatre in Greenville. In this Shakespearian play, Titus’s noble Roman family wages war again Tamora Queen of the Goths. For more information call (864) 235-6948 or visit http://warehousetheatre.com/titus-andronicus-upstate-shakespeare-festival/. July 20 – Hub City Empty Bowls Bowl-Making Session at the West Main Artists’ Co-op in Spartanburg. This event is to make bowls for use in helping to end food insecurity in the area. For more information call (864) 706-3739 or visit http://www.hubcityemptybowls.com/. July 20 – Music by the Lake Concert Series: “The Luck of the Irish” at Furman University Lake amphitheater in Greenville. Enjoy a fun evening of music by the lake and under the stars. For more information call (864) 294-2086 or visit https://news.furman.edu/event/music-by-the-lake-the-luck-of-the-irish/. July 20 – “Kasey Chambers” on the TD Stage in Greenville. This singer/songwriter is one of Australia’s most celebrated country artists. For more information call (864) 467-3000 or visit http://www.peacecenter.org/events/detail/kasey-chambers. 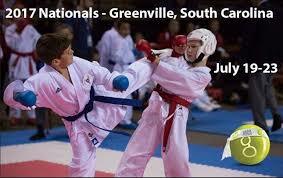 July 20 – 23 – USA Karate National Championships at the Bon Secours Wellness Arena in Greenville. This event features beginners through elite and the members of the Junior National League will be selected during this event who will then compete internationally. For more information call (864) 241-3800 or visit http://www.bonsecoursarena.com/events/detail/usa-karate. July 20 – 23 – South Carolina Quarter Horse Association Horse Show at the T. Ed Garrison Livestock Arena in Pendleton. This show will include roping and cutting, as well as other classes. For more information call (843) 607-5614 or visit http://www.clemson.edu/public/garrison/calendar.html. July 20 – 23 – Peace Chamber Workshop at the Huguenot Mill in Greenville. This workshop provides chamber musicians a chance to hone their skills. For more information call (864) 467-3000 or visit http://www.peacecenter.org/events/detail/peace-chamber-adult-workshop. July 20 – August 6 – “Othello” at the Warehouse Theater in Greenville. You’ll enjoy a fabulous presentation of this Shakespearian play. For more information call (864) 235-6948 or visit https://app.arts-people.com/index.php?actions=4&p=1. July 20 – August 12 – “Million Dollar Quartet” at the Center Stage Theatre in Greenville. This Tony award winning Broadway musical was based on a true story of the famed recording session where Sam Phillips brought together icons Johnny Cash, Carl Perkins, Jerry Lee Lewis, & Elvis Pressley. For more information call (864) 233-6733 or visit https://centrestage.org/million-dollar-quartet/. July 22 – Gaffney Peach Festival Dirt Track Race at the Cherokee Speedway in Gaffney. Come out and enjoy an evening of fun at the race track! For more information call (864) 489-5721 or visit http://www.scpeachfestival.net/dirt-track-race/. July 22 – A Walk Through History at Paris Mountain State Park in Greenville. Learn about the history of the Mountain from 1770 to today on this easy 1 ½ hour walk through the Park. For more information call (864) 244-5565 or visit http://www.southcarolinaparks.com/products/10004485. July 24 – 26 – Junior Survivor Camp at Bart Garrison Agricultural Museum of South Carolina in Pendleton. This camp is for rising 4th to 7th graders. For more information call (864) 646-7271 or visit http://bgamsc.org/events/. July 25 – 30 – Region 12 Youth Jamboree at the T. Ed Garrison Livestock Arena in Pendleton. There will be youth clinics of all disciplines and for all breeds. For more information call (828) 674-1758 or visit http://www.clemson.edu/public/garrison/calendar.html. July 25 – 30 – “Finding Neverland” at Peace Concert Hall in Greenville. This winner of Broadway.com’s Audience Choice Award for Best Musical is one you’ll remember for years to come. For more information call (864) 467-3000 or visit http://www.peacecenter.org/events/detail/finding-neverland. July 26 – “Folkmoot: A Festival of Folk Dance and World Cultures” at the Center Stage Theater in Greenville. Over 100 dancers and musicians from all over the globe will present a fabulous display of cultural folk dances for you to enjoy. For more information call (864) 233-6733 or visit https://centrestage.org/special-events-2/. July 27 – Music by the Lake concert Series: “2017: A Space Odyssey” at Furman University Lake amphitheater in Greenville. Spend your Thursday evening relaxing by the Lake to live music! For more information call (864) 294-2086 or visit https://news.furman.edu/2017/05/05/music-by-the-lake-summer-concert-series-begins-may-25/. July 27 – 30 – Carolina Foothills Dog Show Cluster at the TD Convention Center in Greenville. The Greenville and Piedmont Kennel Clubs will be having an all breeds show so come out and choose your favorite dog. For more information call (864) 350-3445 or visit http://tdconventioncenter.com/events/carolina-foothills-dog-show-cluster/2017/07/27/. July 29 – August 5 – Senior League World Series Baseball at J.B. Red Owens Sports Complex in Easley. Come out and see some of the best baseball you can see in South Carolina! For more information call (864) 855-7933 or visit http://www.slbws.org/. August 1 – After Work Paddle Tour at Lake Blalock Park in Chesnee. Spend the end of your work day taking a relaxing tour of Lake Blalock by kayak. For more information call (864) 578-5442 or visit http://www.spartanburgwater.org/spartanburg-events/85/After+Work+Paddle+Tour. August 3- Music by the Lake Concert Series: Asheville Jazz Orchestra at Furman University Lake amphitheater in Greenville. This will be the last concert of the summer, so come out for one last evening on the Lake! For more information call (864) 294-2086 or visit http://www.furman.edu/academics/music/precollegeandadultprograms/Pages/MusicbytheLake.aspx. August 4 – Food Truck Rollout at Greer City Park in Greer. End your work week with a variety of foods to choose from, tailgating games, and live entertainment! For more information call (864) 735-3948 or visit https://greerstation.com/greer-sc/calendar-of-events/2017/08/04/food-truck-rollout/. August 4 – September 27 – Greenville Center for Creative Arts Member Show at the Greenville Center for Creative Arts in Greenville. This is a chance for the community to see the breadth and depth of works of the Centers members. For more information call (864) 735-3948 or visit http://www.artcentergreenville.org/upcoming-exhibits/. August 4 – 5 – Ed Brown’s Championship Rodeo at Blacksburg’s Outdoor Arena in Blacksburg. See Bronc riding, barrel racing, team roping, and so much more at this fun and exciting event! For more information call (864) 839-6239 or visit http://rodeosusa.com/rodeos/ed-browns-championship-rodeo/. Through July 21 – Arts and Science Camp at Tabernacle United Methodist Church in Buford. Kids will have a chance to enjoy themselves while learning, get a free t-shirt to remember the event by and make new friends! For more information call *903) 285-7451 or visit http://www.lccarts.net/arts–sciences-camp. July 19 – “Swamp Forest” at the Museum of York County in Rock Hill. Learn about the Carolina bottomlands, what makes them special, and the plants and animals that live there from a Ranger who works for the Congaree National Park. For more information call (803) 329-2121 or visit http://www.chmuseums.org/event/2221/. July 20 – Painting Classes with Penny Winslow at Arts Council of Chester County in Chester. There are two sessions: one for kids and one for adults using acrylics and celebrating the importance that the Guernsey cow played in the County’s agricultural history. For more information call (803) 581-2030 or visit http://schumanities.org/events/painting-classes-with-penney-winslow/. July 20 – “The Jungle Book” at the Sumter Opera House in Sumter. Here’s a chance to see one of Disney’s best movies so bring the kids, as the cost is only $1! For more information call (803) 436-2500 or visit http://www.sumtersc.gov/sumter-opera-house. July 20 – Petting Zoo and Camel Rides at the Narroway Theater in Fort Mill. Kids will have the chance to meet some of the Narroway animals and take a ride on a real live camel. For more information call (803) 802-2300 or visit https://narroway.net/petting-zoo. July 21 – “Ghostbusters” at the Sumter Opera House in Sumter. End your week with a fun movie at the Opera House for just $1! For more information call (803) 436-2500 or visit http://www.sumtersc.gov/sumter-opera-house. July 21 – “Back to the Future II” at the Newberry Opera House in Newberry. In this movie both Marty and Doc travel into the future. For more information call (803) 276-6264 or visit http://www.newberryoperahouse.com/shows-and-events.html?show_name=back-to-the-future-ii. July 21 – Concert in the Park at Memorial Park in Newberry. End your work week with a fun evening in the park enjoying music performed by Kyle and Linda Collins who will be performing Broadway music for you. For more information call (803) 276-6264 or visit http://www.newberryoperahouse.com/shows-and-events.html?show_name=free-summer-concerts-in-the-park. July 21 – Find a Furever Friend Friday at the Aiken County Visitors Center in Aiken. If you are searching for a new forever friend, come out and see what is available, get a picture with your new friend, and enjoy some free popcorn with them as well. 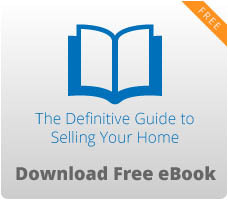 For more information call (803) 642-7557 or visit http://upto.com/e/SMACO. July 22 – Try Pastels with Marcia Kort Buike at the Center for the Arts in Rock Hill. If you’ve ever wanted to try your hand at using pastels, here is your chance. For more information call (803) 328-2787 or visit http://www.yorkcountyarts.org/art-classes. July 22 – Annual Swallow Tailed Kite Outing at the Lower Savannah River Alliance Education Center in Allendale. Birders from all over the southeast come to see these amazing birds so don’t miss this opportunity to see them for yourself! For more information call (706) 826-8991 or visit http://lowersavannahriveralliance.org/events.html. July 22 – Paddlefest at Santee State Park in Santee. If you love the water or have an interest in trying paddle boarding, kayaking or canoeing, or want to introduce these to your kids, participate in workshops, or take a tour along the Lake, come on our and enjoy a day of fun on the water! For more information call (803) 974-1262 or visit http://www.southcarolinaparks.com/products/10004595. July 22 – Moths of Lee State Park at Lee State Park in Bishopville. This evening outing will allow you to see some of the amazing moths that we have in our area of the State. For more information call (803) 428-4988 or visit http://www.southcarolinaparks.com/products/10004426. July 22 – BMX Special Hours at the Main Street Children’s Museum in Rock Hill. 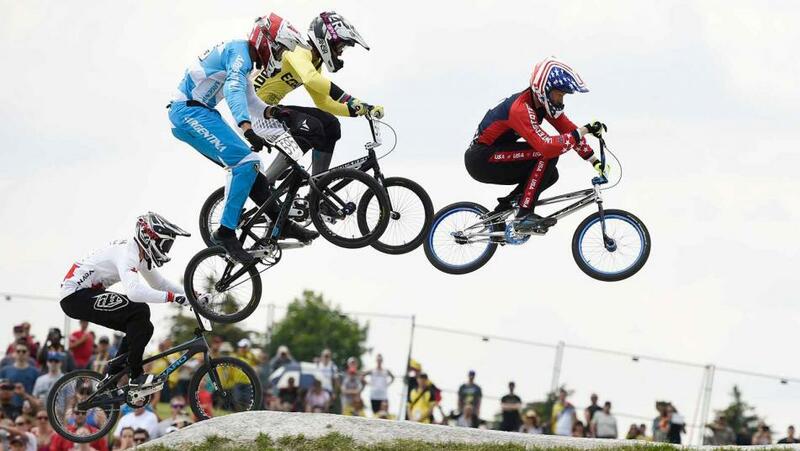 This event is open to the families of those participating in the BMX World Championship. For more information call (803) 327-6400 or visit http://www.chmuseums.org/event/2269/. July 24 – 28 – Arts and Science Camp at the First Baptist Church of Kershaw. Here is a chance for the kids to do something constructive this summer, learn new things and have fun. For more information call (803) 285-7451 or visit http://www.lccarts.net/arts–sciences-camp. July 25 – Historic Cooking at Historic Brattonsville in McConnells. Here is a chance to learn about the food that the Carolina colonists ate. For more information call (803) 684-2327 or visit http://www.chmuseums.org/event/2241/. July 25 – 30 – 2017 UCI BMX World Championships at the Novant Health Supercross Track in Rock Hill. Come out and see the best cyclists in the world and see if you can guess which one will win the title of National Champion. For more information visit http://rockhillscbmx.com/. July 26 – Rock Hill Geology at the Museum of York County in Rock Hill. Learn why the city was named Rock Hill and the different types of rocks and minerals that are found here. For more information call (803) 909-7244 or visit http://chmuseums.org/event/2222/. July 27 – Teacher Appreciation Day at Historic Brattonsville in McConnells. Current teachers and their families can come out for a day of touring the facilities, food, and fun in honor of their work and dedication to the kids they serve. For more information call (803) 684-2327 or visit http://chmuseums.org/event/2244/. July 27 – 29 – “From Charleston with Love” at the Aiken Community Playhouse in Aiken. This beautifully written musical performance will dazzle you! For more information call (803) 684-1438 or visit http://aikencommunityplayhouse.com/shows/. July 28 – “The Emoji Movie: An Adventure Beyond Words” at the Sylvia Theater. Just released, you definitely don’t want to miss this movie! For more information call (803) 684-5590 or visit http://sylviatheatre.com/wp-content/uploads/2013/03/EMOJI-MOVIE.jpeg. July 28 – “Back to the Future III” at the Newberry Opera House in Newberry. This last adventure takes you to the 1880’s Old West. For more information call (803) 276-5179 or visit http://www.newberryoperahouse.com/shows-and-events.html?show_name=back-to-the-future-iii. July 28 – Lecture and Discussion with Chester native Earl Lee, author of “The Gayle” at the Chester War Memorial Building in Chester. For more information call (803) 385-2332 or visit http://schumanities.org/events/lecture-and-discussion-with-native-author-earl-lee-the-gayle/. July 29 – Reptilian Fun with DUPLO & LEGO Bricks 4 Kidz at the Museum of York County in Rock Hill. Boys and girls ages 4 to 13 can participate in one of three workshops where they will learn about reptiles then build a Bricks 4 Kidz model. For more information call (803) 329-2121 or visit http://chmuseums.org/event/2278/. July 29 – Lando History Night at the Lando-Manetta Mills History Center in Lando. Learn about the history of Lando with a slide show presentation by Winthrop professor Phil Moody. For more information call (803) 789-6361 or visit http://schumanities.org/projects/the-way-we-worked/the-way-we-worked-schedule-of-events/. July 29 – Tour of Great Falls Dam and Power Plant at the Great Falls Dam and Power Plant in Great Falls. Here’s a chance to tour the power plant and view the dam. For more information call (803) 482-2370 or visit http://schumanities.org/projects/the-way-we-worked/the-way-we-worked-schedule-of-events/. July 29 – Moths of Lee State Park at Lee State Park in Bishopville. This evening event will allow you to see some of the beautiful moths that come out when we are sleeping so we rarely get a chance to see them. For more information call (803) 428-4988 or visit http://www.southcarolinaparks.com/products/10004426. August 1 – Dairying on the Plantation at Historic Brattonsville in McConnells. See how the Plantation is trying to keep the art of raising dairy cows and making butter alive today. For more information call (803) 684-2327 or visit http://chmuseums.org/event/2242/. August 2 – Total Solar Eclipse at the Museum of York County in Rock Hill. See a planetarium show about eclipses and determine if you are ready to see one. For more information call (803) 329-2121 or visit http://chmuseums.org/event/2256/. August 3 – “Earnie Haase & Signature Sound” at the Newberry Opera House in Newberry. These Dove Award Winning musicians are outstanding! For more information call (803) 276-5179 or visit http://www.newberryoperahouse.com/shows-and-events.html?show_name=ernie-haase-signature-sound. August 4 – Apollo 13 at the Newberry Opera House in Newberry. What would you do if an oxygen tank explodes and you have a choice to suffocate or freeze to death. For more information call (803) 276-5179 or visit http://www.newberryoperahouse.com/shows-and-events.html?show_name=apollo-13. August 5 – “John Lambardi” at the Sylvia Theatre in York. If you haven’t seen this amazing illusionist and magician before, you must take the opportunity and see this tremendous performer. For more information call (803) 684-5590 or visit http://sylviatheatre.com/. August 5 – Solar Astronomy Day at the Museum of York County in Rock Hill. Prepare for this upcoming amazing event and know everything you need to know prior to viewing the event. For more information call (803) 329-2121 or visit http://chmuseums.org/event/2257/. August 8 – Antebellum School Days at Historic Brattonsville in McConnells. Learn about the Brattonville Female Seminary and what schooling was like for girls in the 1840’s. For more information call (803) 684-2327 or visit http://chmuseums.org/event/2243/. Fridays and Saturdays – Charleston Night Market at Market Street in Charleston. For more information call (843) 937-0920. Through July 22 – Bob Bell Charleston Summer Classic at the Mullet Hall Equestrian Center on Johns Island. Come out and see some fabulous riding! For more information call (843) 768-5503 or visit http://www.charlestoncvb.com/events/bob-bell-charleston-summer-classic-horse-show~8475/. Through July 23 – Junior SOS at the Ocean Drive Golf and Beach Resort in North Myrtle Beach. This event will be 6 days of workshops, competitions, and loads of fun! For more information visit http://www.juniorshaggers.com/jsa_jrsos.html. Through September 24 – “Artist, Scientist, Explorer: Mark Catesby in the Carolinas” at the Gibbes Museum of Art in Charleston. From the British Royal Collection, see the works of this tremendous “English artist, scientist, and explorer who spent four years documenting the natural habitats of the Carolinas, Florida, and the Bahamas.” For more information call (843) 722-2706 or visit http://www.gibbesmuseum.org/exhibitions/artist-scientist-explorer-mark-catesby-in-the-carolinas/83. Through September 20 – “Artists Painting Artists” at the Gibbes Museum of Art in Charleston. See the amazing works of artists who painted other artists who were their friends, well admired and respected as the artists they are/were. For more information call (843) 722-2706 or visit http://www.gibbesmuseum.org/exhibitions/artists-painting-artists/82. July 20 – Adult Only Night at the Brewseum: Christmas in July at the Children’s Museum of the Lowcountry in Charleston. Here is the chance for the adults to be kids again with hands on activities, competitive games, music, and even a silent disco, along with delicious food, brews, and wine included. For more information call (843) 853-8962 or visit http://explorecml.org/calendar/adults-only-night-at-the-brewseum-christmas-in-july/. July 20 – “Magic Men Live” at the House of Blues in Myrtle Beach. Ladies, you don’t want to miss this amazing show! For more information visit http://www.houseofblues.com/myrtlebeach/EventDetail?tmeventid=0E0052B3F2F8824B&offerid=49460. July 20 – Movie Night at Shelter Cove Park on Hilton Head Island. Grab a blanket and some refreshments and come to the park for a fun night enjoying “The Princess Diaries”. For more information call (843) 757-9889 or visit http://www.sheltercovetownecentre.com/events/. July 20 – 21 – May River Shrimp Festival at the Oyster Factory Park on May River in Bluffton. You’ll enjoy delicious seafood, homegrown music, craft vendors, all in a kid and pet friendly environment. For more information call (843) 757-8520 or visit http://www.bluffton.com/events/event/may-river-shrimp-festival/. July 21 – Mystical Moths at the Caw Caw Interpretive Center in Ravenel. Bait has been set out, so come out and see what types of beautiful moths we can find at the Center. For more information call (843) 795-4386 or visit http://ccprc.com/Calendar.aspx?EID=8042. July 21 – Sound of Summer Concert Series: “Oracle Blue” at the North Myrtle Beach Park and Sports Complex in Little River. Enjoy a little jazz, funk, and pop to help you start out your weekend! For more information call (843) 280-5570 or visit http://parks.nmb.us/festivalsevents/concerts/sounds-of-summer-concert-series/. July 21 – Sunset Celebration at the Shelter Cove Park pavilion on Hilton Head Island. You’ve had a long week and are ready to relax, so come out for some live entertainment with “Low Country Boil”. For more information call (843) 686-3090 or visit http://www.sheltercovetownecentre.com/events/. July 21 – Reggae Nights Summer Concert Series at James Island County Park in Charleston. End your week with some fun reggae music by “Jah Works” while enjoying refreshments and a wonderful setting! For more information call (843) 795-4386 or visit http://ccprc.com/1619/Reggae-Nights. 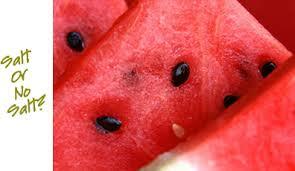 July 21 – 22 – Pageland Watermelon Festival in downtown Pageland. In addition to having the chance to eat a lot of watermelon, you’ll enjoy a parade, music, crafts, a rodeo, and so much more! For more information call (843) 672-6400 or visit http://pagelandwatermelonfestival.com/. July 21 – 23 – “Let the Good Times Roll” at the Charleston Music Hall in Charleston. This spectacular variety show will provide you with everything from pop, rock and country, to Broadway. For more information call (843) 853-2252 or visit http://www.charlestonmusichall.com/event/1324305-let-good-times-roll-2017-charleston/. July 22 – Dark Night Astronomy Observing at Johns Island County Park on Johns Island. Here’s a chance to see the sky from one of the darker locations in the Charleston area and with the assistance of the Lowcountry Stargazers you’ll be able to see some of the planets, the moon, and stars. For more information call (843) 212-5857 or visit http://ccprc.com/Calendar.aspx?EID=6647. July 22 – What’s Walking in the Park at Little Pee Dee State Park in Dillon. Game cameras have been set up, so see what has been walking through the park, and learn why the animals choose the locations they do, as well as having the opportunity to make a casting of the footprint of one of the animals. For more information call (843) 774-8872 or visit http://southcarolinaparks.com/products/10004509. July 22 – “On the Border: The Ultimate Eagles Tribute” at the House of Blues in Myrtle Beach. If you are an Eagles fan, you will certainly enjoy this show filled with the bands best songs! For more information visit http://www.houseofblues.com/myrtlebeach/EventDetail?tmeventid=0E0052D4B946384B&offerid=49698. July 22 – “Hank Williams, Jr.” at the Volvo Car Stadium on Daniel Island. Here’s coming so get your tickets now, as this will surely be a sold out show! For more information call (843) 849-5300 or visit http://www.familycircletenniscenter.com/page.lasso?p=content_concerts. July 22 – Children’s Discovery Program: American Girl Tea Party at the Nathaniel Russell House Museum in downtown Charleston. Children can bring their American Girl dolls and have a day of playing dress up, make a fan, tour the house, and have a fun tea party. For more information call (843) 723-1623 or visit https://www.historiccharleston.org/Education/Children-S-Discovery-Tours/Archaeology-Afternoon-(24).aspx. July 23 – Couple’s Challenge Course Challenge at the James Island County Park on James Island. This is a great opportunity for you and your spouse or significant other to spend time together and helping one another through the obstacles of this course. For more information call (843) 795-4386 or visit https://www.ccprc.com/Calendar.aspx?EID=8188. July 23 – “Jamie Johnson” at the House of Blues in Myrtle Beach. You’ll enjoy a fun evening of great country music with this amazing artist. For more information visit http://www.houseofblues.com/myrtlebeach/EventDetail?tmeventid=0E00528BC1E93480&offerid=46707. July 23 – “Jason Isbell and the 400 Unit” at the North Charleston Performing Arts Center in North Charleston. This two time Grammy Award winner will provide you with a performance you won’t forget. For more information call (843) 529-5000 or visit https://www.northcharlestoncoliseumpac.com/events/detail/jason-isbell. July 25 – Summer Concert Series at Moreland Village in Bluffton. Enjoy a fun evening out with live entertainment by “The Bushels”. For more information call (310) 664-8867 or visit https://www.palmettobluff.com/experience/special-events/summer-concert-series.aspx. July 27 – Movie Night in the Park at Shelter Cove Park on Hilton Head Island. The movie of the evening is “Tarzan” so pack a picnic and come out for a fun night under the stars. For more information call (843) 757-9889 or visit http://scliving.coop/events/movie-nights-park/. July 27 – Challenge Course Open Day at James Island County Park in Charleston. Challenging yourself on this exciting challenge course, ending with an exhilarating ride down the zip line! For more information call (843) 795-4386 or visit https://www.ccprc.com/Calendar.aspx?EID=8082. July 27 – Nature Rambles: Peeking around Palmetto Islands at Palmetto Islands County Park in Mount Pleasant. Take a walk through the park with a Master Naturalist and see the park from a perspective you haven’t had before. For more information call (843) 795-4386 or visit https://www.charlestoncitypaper.com/charleston/nature-rambles-peeking-around-palmetto-islands/Event?oid=9023447. July 28 – Decades Rewind at the Charleston Music Hall in Charleston. This theatrical concert will cover the 60’s through the 80’s, and everything from Aretha to Zeppelin. For more information call (843) 853-2252 or visit http://www.charlestonmusichall.com/event/1485292-decades-rewind-charleston/. July 28 – Sunset Celebration at the Shelter Cove Towne Center on Hilton Head Island. Enjoy an evening out with live entertainment by “The Headliners”. For more information call (843) 686-3090 or visit http://scliving.coop/events/sunset-celebration/. July 28 – 29 – “101 Dalmations Kids” at the Dock Street Theater in Charleston. Produced by kids who attended the summer theater camp, this show will certainly be one not to miss! For more information call (843) 577-7183 or visit https://www.charlestonstage.com/shows-and-tickets/36-summerstage-musical-theatre-camp-production.html. July 29 – “Seether: Poison the Parish World Tour” at the House of Blues in Myrtle Beach. This will most certain be an amazing show! For more information visit http://www.houseofblues.com/myrtlebeach/EventDetail?tmeventid=0E005256D1C08077&offerid=43139. July 29 – Palmetto Paddle at Brittlebank Park in Charleston. There will be a 3 mile short and an 8 mile long course with several different divisions, with food and music provided throughout the day and all followed by several after parties. For more information visit https://www.palmettopaddle.com/race. July 30 – “311” with special guests “New Politics” at the House of Blues in Myrtle Beach. Enjoy an evening of good music and entertainment. For more information visit http://www.houseofblues.com/myrtlebeach/EventDetail?tmeventid=0E0052610D71BEAD&offerid=45441. July 30 – “An Acoustic Evening with Patty Griffin & Lee Ann Womack” at the Charleston Music Hall in Charleston. These two amazing musicians will most certainly provide you with an unforgettable evening of entertainment! For more information call (843) 853-2252 or visit http://www.charlestonmusichall.com/event/1500241-acoustic-evening-patty-charleston/. July 30 – Charleston Spring Triathlon Series Race 4 at James Island County Park in Charleston. This is the fourth race in the series, so if you’re participating, keep it up, and if not, come out and support those who are. For more information call (843) 795-4386 or visit https://ccprc.com/1507/Charleston-Sprint-Triathlon. August 3 – Movie Nights in the Park at Shelter Cove Park on Hilton Head Island. “Herbie Rides Again” is the movie of the night, so be sure to bring the kids out for a fun night in the park. For more information call (843) 757-9889 or visit http://scliving.coop/events/movie-nights-park/. August 3 – Challenge Course Open Day at the James Island County Park in Charleston. Enjoy a fun and challenging course followed by an exciting ride down the zip line! For more information call (843) 795-4386 or visit https://www.ccprc.com/Calendar.aspx?EID=8082. August 4 – “Government Mule” at the Volvo Car Stadium on Daniels Island. For more information call (843) 856-7900 or visit https://www.livenation.com/events/665465-aug-4-2017-gov-t-mule. August 4 – “Sail On: A Beach Boys Tribute” at the Charleston Music Hall in Charleston. Playing all your favorite beach boys songs, you will certainly enjoy an evening of entertainment by this amazing band. For more information call (843) 853-2252 or visit http://www.charlestonmusichall.com/event/1496724-sail-on-beach-boys-tribute-charleston/. August 4 – Reggae Nights Summer Concert Series: “Mystic Vibrations” at the James Island County Park in Charleston. Enjoy an evening out with live entertainment and a whole lot of fun! For more information call (843) 795-4386 or visit http://ccprc.com/1619/Reggae-Nights. August 4 – Sunset Celebration at the Shelter Cove Towne Center on Hilton Head Island. Enjoy an evening out with live entertainment by “The Headliners”. For more information call (843) 686-3090 or visit http://scliving.coop/events/sunset-celebration/. August 4 – 6 – Craftsmen’s Summer Classic Art and Craft Festival at the Myrtle Beach Convention Center in Myrtle Beach. Start your holiday shopping early by coming to this fun show with many one of a kind gifts. For more information call (336) 282-5550 or visit http://www.gilmoreshows.com/craftsmens_classics_myrtle_summer.shtml. August 4 – 6 – Gullah/Geechee National International Music and Movement Festival at various locations on St. Helena Island. Enjoy a weekend filled with music and dancing, as well as food, all while learning about this amazing culture of coastal South Carolina. For more information call (843) 838-1171 or visit http://www.gullahgeechee.info/. August 4 – 6 – Lowcountry Summer Coin Show at the Exchange Park Fairgrounds in Ladson. If you’re a seller, a collector, or just interested, come on out and see what we have! For more information send an email to lowcountrycoinclub@att.net or visit http://www.lowcountrycoinclub.com/. August 5 – Business Empowerment and Career Fair at the Florence Civic Center in Florence. If you are in search for a job or just need some guidance on how to be more successful in your current job, or just come out a visit with the vendors just in case you might be contemplating a career change. For more information call (843) 679-9417 or visit http://www.florenceciviccenter.com/events/detail/bus_expo. August 5 – Canoeing at Caw Caw: Sunrise Salt Marsh Paddle at the Caw Caw Interpretive Center in Ravenel. Start your day with the serenity of nature looking for otters, swallowtail kites or other beauties of nature along the way. For more information call (843) 795-4386 or visit https://www.ccprc.com/Calendar.aspx?EID=7978&month=8&year=2017&day=5&calType=0. August 5 – Early Morning Bird Walks at Caw Caw at the Caw Caw Interpretive Center in Ravenel. Come see what types of amazing birds grace this beautiful area. For more information call (843) 795-4386 or visit https://www.ccprc.com/Calendar.aspx?EID=7998&month=8&year=2017&day=5&calType=0. August 5 – Unveiling McLeod Plantation Historic Site at the McLeod Plantation Historic Site in Charleston. Learn the deep history of the Plantation and gain an understating of some of the people who once lived here. For more information call (843) 795-4386 or visit https://www.ccprc.com/Calendar.aspx?EID=8053&month=8&year=2017&day=5&calType=0. August 5 – High and Dry Moonlight Canoe Float at Little Pee Dee State Park in Dillon. Since the Lake is dry, you’ll use your imagination and get to know the park in the twilight hours. For more information call (843) 774-8872 or visit http://www.southcarolinaparks.com/products/10004613. August 6 – Say Yes to the Dress at the North Charleston Wannamaker County Park in North Charleston. Ladies with special needs are invited to select a dress or evening gown free of charge to wear to the Special Needs Prom to be held on August 18.For more information call (843) 795-4386 or visit https://www.ccprc.com/Calendar.aspx?EID=7657&month=8&year=2017&day=6&calType=0. August 8 – Summer Concert Series: “Bottles & Cans” at the Wilson Village at Palmetto Bluff in Bluffton. Enjoy an evening of fun live entertainment to help you unwind at the end of the day. For more information call (310) 664-8867 or visit https://www.palmettobluff.com/experience/special-events/summer-concert-series.aspx.